While The Mistah and I don’t exclusively eat South Beach cookbook recipes anymore, I still keep my eyes open for SB Friendly recipes on the Interwebs. What can I say, the SB approach really has worked for us. I still have people tell me that the weight loss is noticeable, and this is almost two years later. I may not have reached that elusive Driver’s License weight, but I’m more comfortable in my own skin that I have been in quite some time. And it doesn’t hurt that the SB Friendly dishes we eat taste good or that The Mistah says my skinny jeans look freaking awesome. BAH Note: You don’t have to be on South Beach to enjoy this savory muffin. It makes a great light snack or quick breakfast if you make them in advance. Don’t be like me and neglect to spray the paper liners with cooking spray. Because scraping savory muffin out of the paper liner is not a good start to a day. And be prepared to pay a pretty penny for the almond flour. Luckily, there’s a French Macaron recipe in The Sweet Life in Paris that uses almond flour. While definitely not a SB Friendly recipe, I think there’s room for French cookies once in a while...at least until the skinny jeans tell me otherwise. Combine the cottage cheese, Parmesan, wheat and almond flour, baking powder, and salt in a medium bowl. Beat the eggs and water together and add to the bowl. Mix well to combine. Add the canadian bacon and grated cheddar to the bowl and fold to combine. Place 8 paper liners in a muffin pan and coat the liners lightly with a nonstick cooking spray. Divide the batter among the liners and bake for 20 to 25 minutes or until the tops are lightly browned and the egg has set. 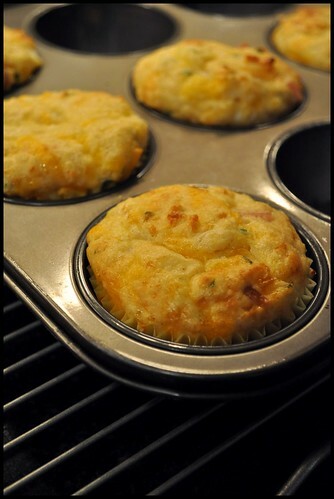 Leftover muffins can be cooled completely and stored in the refrigerator. Dang! My kids actually might consume these without a fight! Thanks, Wendi! Kitch, let me know if spraying the paper liners with nonstick spray makes these savory little morsels easier to remove.